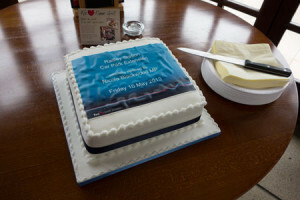 New Railway Station Car Park Extension Officially Opened …but now you’ll have to pay! 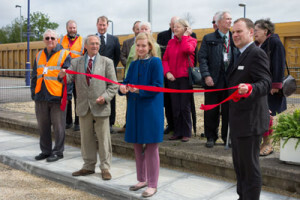 The newly completed car park extension at Radley Railway Station was today officially opened by local MP, Nicola Blackwood. 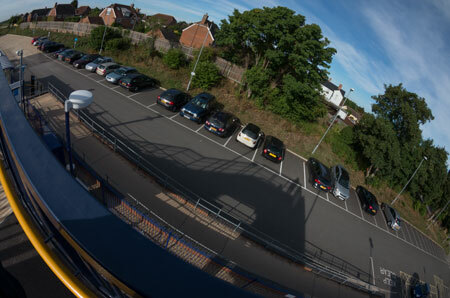 However the event also marks the end of free parking at the station, as charges will apply from Monday 13th May. 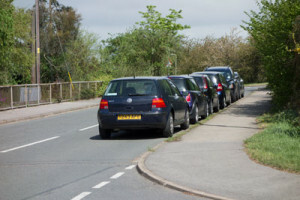 Local people are very apprehensive that this will bring about a return to commuters parking their vehicles on nearby village streets, which was a source of considerable aggravation while the car park was being constructed and has been a problem ever since the Bowyer Arms made their car park unavailable to station users. 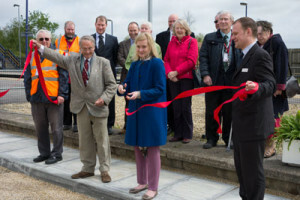 There is no doubt that extra parking facilities at the station are needed and this was recognised by the County Council and First Great Western (FGW) who were able to secure funding for them quite quickly. However a condition for the funding is that it is to support a commercial venture, and FGW has interpreted this as meaning that they are obliged to impose parking charges. Consequently, a daily charge of £3 will come into effect on Monday 13th May. This is despite opposition from the Parish Council, Friends of Radley Station and, of course, rail users. The problem has been brought to the attention of the Highways Authority who have promised to monitor the situation and take action as necessary, though this may mean Traffic Orders and parking restrictions, which could affect residents. Meanwhile, on the very day of the opening, the new car park extension was largely empty with many would-be users having reverted to parking their vehicles on nearby streets – and this is even before the charges have come into force! 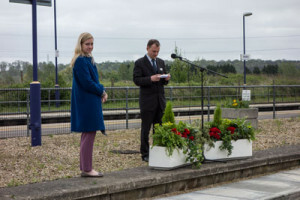 Dave Martin of First Great Western introducing Nicola Blackwood MP at the car park opening ceremony on 10 May 2013. Local dignitaries and members of the public at the opening ceremony. 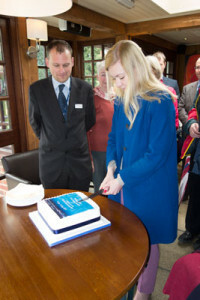 Above and below: Nicola Blackwood cutting the ribbon to mark the official opening of the Radley Railway Station car park extension, 10 May 2013.
which Nicola Blackwood also had to cut, and then eat. Meanwhile commuters have been voting with their wheels by parking in the road outside, rather than in the new car park, despite charges having not yet been brought into force. 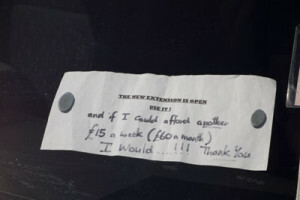 A note in the windscreen of one commuter’s vehicle registering a protest against the charges. 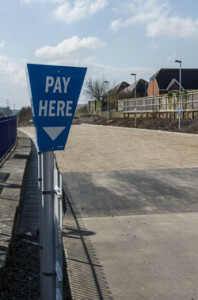 However a condition for the funding is that it is to support a commercial venture, and FGW has interpreted this as meaning that they are obliged to impose parking charges. The statement by First Great Western underlying this seems to have been a downright lie. 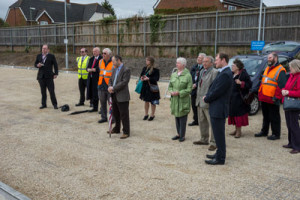 Further investigations have revealed that the car park was largely funded by public money in the form of a grant from the Department of Transport (DoT). The DoT has said that they did not impose any condition requiring that charging be imposed being fully cognisant of the overspill problems that would probably be caused by so doing. Meanwhile the Parish Council is fighting to get the charging removed or ameliorated before the village roads become plastered in yellow paint. A Public Meeting to address these concerns is to take place in the Village Hall on Wednesday 9th October at 7.30pm. Councillor Rodney Rose, the Oxfordshire County Council Cabinet member with responsibility for strategic rail, a senior representative from First Great Western, a representative from Thames Valley Police Authority and a County Council officer will attend. For details of what happened at the public meeting, click here. whilst cars are parked elsewhere on the village streets. area, in which there are 18 visible empty spaces.